Monday evening was the Metropolitan Gala. It is one of the most anticipated social events of the year. In honor of the Vogue editor who has raised millions for the institute and has made the gala the event that it is today, The Metropolitan Costume Institute was recently renamed the Anna Wintour Costume Center. Every gala is accompanied by a exhibit of a fashion designer. This year, the designer is Charles James. He is unknown to most, but those who do know him recognize him as the best American Couturier. The event has always had a theme and been formal attire for women, but there was never any dress requirements for the men. Remember one year, Marc Jacobs wore white boxer shorts under a lace dress. This year Anna Wintour requested that the men wear white tie. Although Barack and Michelle did not make an appearance, there were still some pretty good looking couples. Victoria and David Beckman. Victoria is wearing her own design and David is wearing Ralph Lauren. Charlize Theron and Sean Penn. Charlize is wearing Dior couture. Blake Lively and Ryan Reynolds both in Gucci. 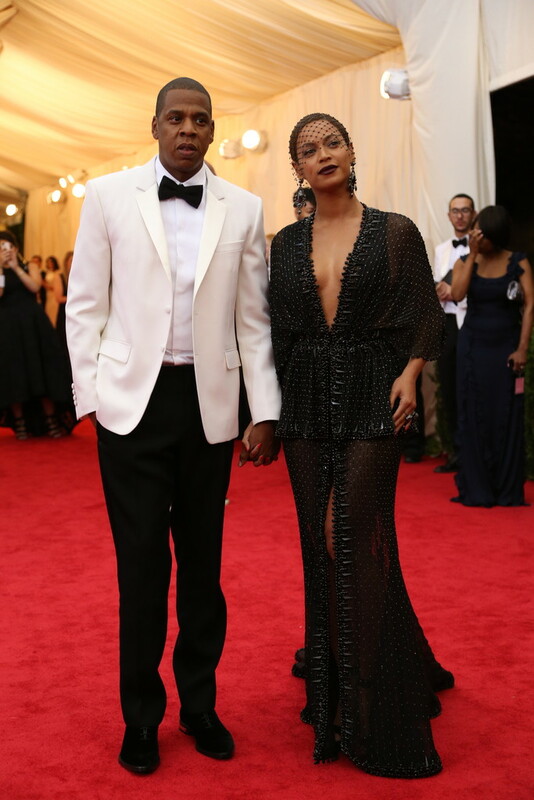 Beyonce and Jay Z. Beyonce’s gown is designed by Givenchy. Giselle Bundchen and Tom Brady. Giselle is wearing Balenciaga. A few opted for cocktail dresses instead of gowns. Marion Cotillard in Dior. Michelle Williams in Prada. Rosie Huntington Whitely in Balmain. Rachel McAdams in Ralph Lauren. Suki Waterhouse in Burberry. She is dating to Bradley Cooper. Lucky woman! Who was your favorite? You can look at the my post about last year’s Metropolitan Gala. I always look forward to your gala posts! Thank youuuu! I do not think Oscar’s name is photo shop addition. It surprised me also. Did you see Hailee Steinfeld’s Prabal Gurung gown? She was dressed for the evening in a black and white elegant couture gown. Hailee looked amazing. Wow!Fabulous.I loved Rosie in Marchesa,Ryan and Blake always favorite couple.Korolina and SJP are so glamorous.Loved this! Glad you enjoyed the post. The Metropolitan Gala continually showcases the best couture fashion of the year.